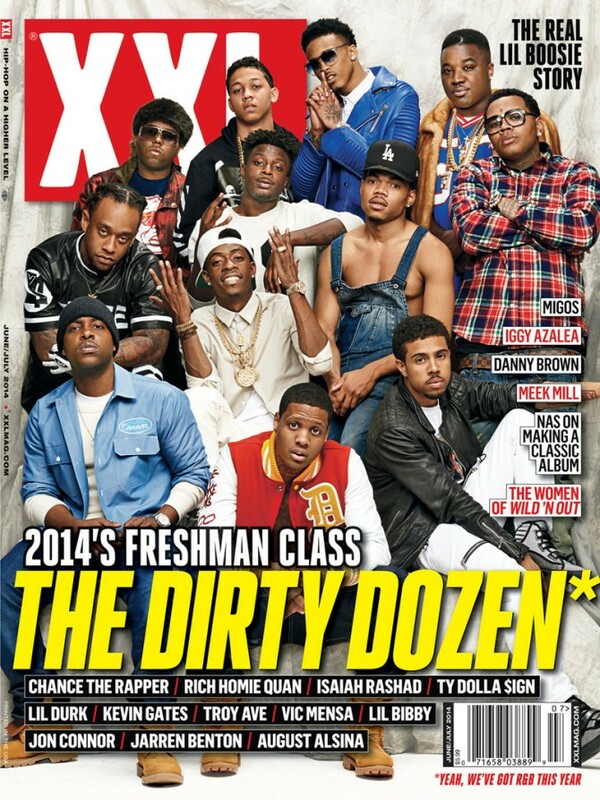 Yesterday XXL magazine debuted its seventh-annual "Freshman cover" on BET's weekday music video show 106 & Park, and in addition to profiling 12 buzzing rappers the issue could pass for a special about Chicago hip-hop. A third of the MCs who appear on the cover are local—Lil Bibby, Chance the Rapper, Lil Durk, and Vic Mensa—and they've all popped up in the Reader before. I first mentioned Lil Durk in my 2012 cover story on the relationship between local streetwear brands and rappers—Durk signed a deal with Def Jam in the middle of a major label gold rush aimed at scooping up new Chicago rappers earlier that year, and he's occasionally appeared in my pieces since then. Lil Bibby has also cropped up in some of my pieces since last spring when I briefly wrote about a compilation mixtape he dropped with frequent collaborator Lil Herb called Heir Apparents; Bibby's Free Crack mixtape got the Gossip Wolf seal of approval in the fall. I'd written about Vic Mensa before the release of his breakout 2013 mixtape, Innanetape, back when he was a member of now-defunct band Kids These Days—in 2012 I wrote a Soundboard preview for their headlining show at the Vic. Chance the Rapper has been in the Reader even before he appeared on the B Side cover a year ago (which he references on Acid Rap's second track, "Pusha Man"), and I've been writing about him since he was preparing to drop his debut mixtape, #10Day. It's a coincidence that the week XXL announces its "Freshman cover" the Reader is publishing our a cover story on five local rising rappers: Alex Wiley, Saba, Spenzo, Taylor Bennett, and ZMoney. I say "coincidence" because when I pitched this story I wasn't inspired by XXL's annual list but by the rappers I wanted to profile; each of them had released music that stuck with me and also spoke to the variety of sounds brewing in the city's hip-hop scene. My desire to write about each of them was so strong that I knew I had to write about all of them. I imagine it won't be long before the rappers who appear on this week's B Side wind up on the cover of XXL—pick up the issue when it hits the streets in a couple days and read my feature here. And it's not just because Billboard R&B star Jeremih shows up on the track.